Software testing is one of the most integral parts of application development program and a milestone in software development life cycle. A software development process is very complicated and filled with errors which are the reason why software testing is performed. Every application Development Agency would want to provide high quality and reliable program to their clients which meet all the requirements of theirs. Many IT students aspire to become a professional software tester, however, it is easier said than done. In order to become a software tester, it is important to learn various aspects of software development, including programming, coding, and identifying and fixing errors. This can be done by joining a software testing training institute in Delhi NCR, who is well known to offer an industry relevant and job oriented training to learners. To find errors and bugs in the development phase in order to increase its ability to perform its functions. To eliminate unnecessary elements from the product that would only cause trouble to the client. To enhance the user satisfaction and keep the customer loyal to the agency for years. To increment the sales and revenue of the company by offering the best of services to the market. Develop software that requires low maintenance, consistent and accurate in providing the results. Decrease the quantity of failures, helping the client to prosper and grow their business. What topics will be covered in the software testing training course and how will I benefit from them? The software testing training course from well-recognized training institute in Delhi NCR would help the learner gain intense knowledge and skills on various topics that would assist them in becoming a valuable asset for any software development agency. During this short-term job oriented course, you will be taught on topics such as web development, fundamentals and principles of software testing, SDLC vs STLC, manual testing, automation testing, regression testing, integration testing, unit testing, developing test cases, identifying defects, test management, implementation and execution of test cases, quality reassurance vs quality control, and much more. After the training, the applicant will be able to develop test cases and identify defects in developed software, translate functional requirements and specify test plans, cases, and steps. He or she can also write and execute test scripts, perform manual and automation testing, create and maintain test data, scripts, and tools, offer assistance to the software development team and HR team, find out issues that slow the development process, etc. The training would be most beneficial for you when you go for an interview for the profile of software tester in any web development agency. You will be able to impress the employer with your resume and knowledge and have more chances of acquiring the position as compared to other candidates. You won’t require start-up training when you join your job, resulting in possible job growth at an early stage. Where can I join software testing training in Gurgaon? There are many software testing training institutes in Gurgaon and NCR region, however, you should first make a thorough research before deciding. 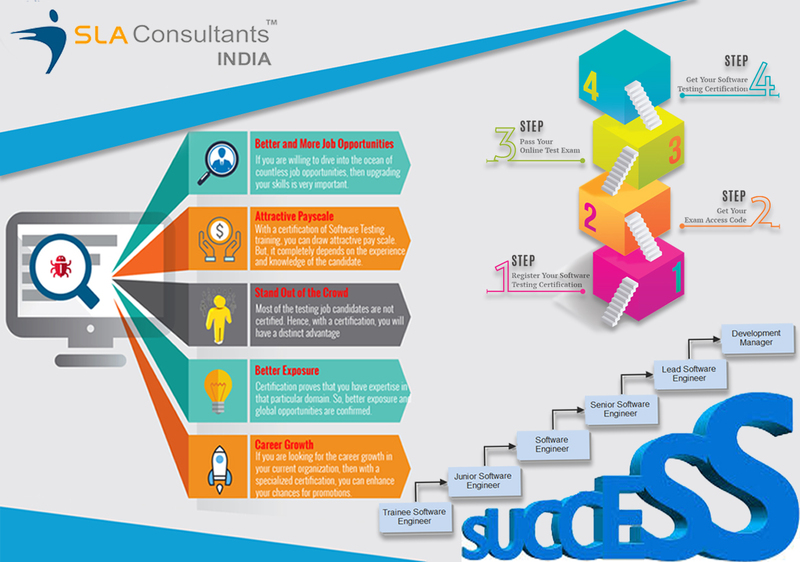 SLA Consultants India is a reputed and accredited training firm located in Delhi and Gurgaon and has been training learners for over 10 years successfully. Their software testing training program is considered one of the best in the country with corporate industry trainers with vast experience in the field. They offer real-time training, workshops, and handouts, projects, and assignments along with 100% job placement assistance. They have an excellent success ratio with most of their students currently joined in reputed industries for a permanent position. If you are also looking for a leading software testing institute in Delhi, Gurgaon or Noida, then SLA Consultants India is certainly the most obvious choice you could ever have. To know more about the course or the institute, please visit their official website or simply step into one of their offices.